Habit: Annual, biennial; hairs sessile, stellate, occasionally also simple. Leaf: basal rosetted, petioled, pinnately lobed to dentate or entire; cauline sessile, sagittate to basally lobed or clasping. Inflorescence: elongated. Flower: sepals erect to ascending, base sac-like; petals obovate to spoon-shaped, white or +- pink. Fruit: silicle, obtriangular-obcordate, dehiscent, unsegmented, flat perpendicular to septum; valves veined; stigma entire. Seed: (10)20--40, in 2 rows per chamber, wingless. Habit: Stellate hairs 3--5-rayed, simple hairs generally at plant base. 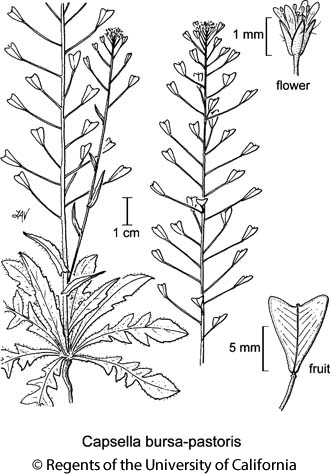 Stem: erect, simple or branched distally, (0.5)1--5(7) dm. Leaf: basal 3--6 cm, oblanceolate, +- entire to pinnately lobed or dissected; cauline 1--5.5(8) cm, oblong, linear to lanceolate. Flower: sepals 1.5--2 mm; petals (1.5)2--4(5) mm, obovate, white (pink). Fruit: (3)4--9(10) mm, base wedge-shaped, tip notched or not, glabrous; pedicel spreading to ascending, (3)5--15(20) mm, slender. Chromosomes: 2n=32. Citation for this treatment: Ihsan A. Al-Shehbaz 2012, Capsella bursa-pastoris, in Jepson Flora Project (eds.) Jepson eFlora, http://ucjeps.berkeley.edu/eflora/eflora_display.php?tid=17109, accessed on April 24, 2019.